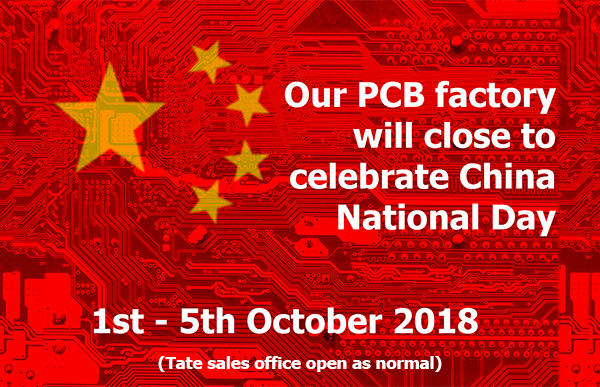 Our offshore factory will close to celebrate China National Day from 1st – 5th October 2018. (Please note that the Tate UK sales office will remain open as normal). We recommend placing PCB orders as early as possible this month to ensure boards are shipped to you ahead of the shutdown. If urgent requirements arise nearer to the shutdown date, please don’t hesitate to ask our sales team for an express price in order to get the boards manufactured and shipped before the end of September. Please note that all orders requesting an October delivery will be shipped from our offshore factory on 08/10/2018. If you need the boards ahead of this date, please let us know so we can request delivery before the shutdown. Our sales team look forward to receiving your orders.